Christine Byl first encountered the national parks the way most of us do: on vacation. But after she graduated from college, broke and ready for a new challenge, she joined a Glacier National Park trail crew as a seasonal “traildog” maintaining mountain trails for the millions of visitors Glacier draws every year. Byl first thought of the job as a paycheck, a summer diversion, a welcome break from “the real world” before going on to graduate school. She came to find out that work in the woods on a trail crew was more demanding, more rewarding—more real—than she ever imagined. During her first season, Byl embraces the backbreaking difficulty of the work, learning how to clear trees, move boulders, and build stairs in the backcountry. Her first mentors are the colorful characters with whom she works—the packers, sawyers, and traildogs from all walks of life—along with the tools in her hands: axe, shovel, chainsaw, rock bar. As she invests herself deeply in this new work, the mountains, rivers, animals, and weather become teachers as well. Though Byl expected that her tenure at the parks would be temporary, she ends up turning this summer gig into a decades-long job, moving from Montana to Alaska, breaking expectations—including her own—that she would follow a “professional” career path. Returning season after season, she eventually leads her own crews, mentoring other traildogs along the way. In Dirt Work, Byl probes common assumptions about the division between mental and physical labor, “women’s work” and “men’s work,” white collars and blue collars. The supposedly simple tasks of digging holes, dropping trees, and blasting snowdrifts in fact offer her an education of the hands and the head, as well as membership in an utterly unique subculture. 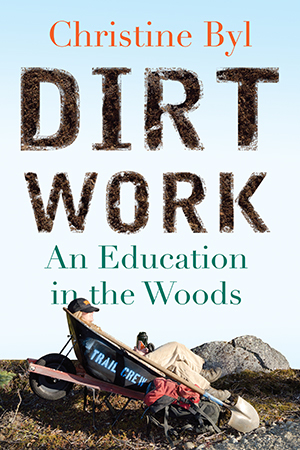 Dirt Work is a contemplative but unsentimental look at the pleasures of labor, the challenges of apprenticeship, and the way a place becomes a home. On the front porch of Frida’s, we sit feet-up on the railing. If you walk by, glance at the clapboard bar, you’ll see us there--four men and one woman; dirty pants, boot soles mud-caked. Eyebrows black. In West Glacier, Montana, on the front porch of Frida’s, it’s beer thirty on the last day of a hitch and we’ve forgiven each other everything: the annoying way one guy chomps his cereal, how so-and-so always leaves the tool cache a mess. On the porch on day eight, crew leaders and laborers, fast hikers and slow, we’re just company. We rib each other and toast a job well done. We narrate the week, ushering it into our oral tradition: Can you believe the packer lost a load on the Ole Creek ford? How big you think that tree you logged out was? What was the best dinner? The worst weather? Are your boots dry yet? Are yours? A woman in river sandals and a visor stops on the stairs. “Are you trail crew” “Yup,” Justin nods. Her boyfriend works on the east side crew, she says. She’s a raft guide, but she might put in for trails next year. She’s right. I am lucky. I’m lucky my job smashes me face-first against my limits. Lucky I get paid to sleep in a tent and piss in the brush. I’m lucky to be one of these guys, yet also not: lover to one, leader to some, daffy kid sister to the rest. I’m lucky that I like my eyebrows matted, my knees a little stiff, my heart rate low and steady. Who knows how any of us ends up where we’re meant to be? I’m lucky that I stumbled into this life and got to stay. We finish our beers, swigging the last warm inch of Miller Genuine Draft from plastic cups, and clump down the stairs. Some of us will meet to climb a peak on our days off. Others go home to families, houses in town, and won’t see anyone from work until we gather at the barn for the next hitch. We slap grimy palms, grab fingers, and punch fists in the routine crew farewell. Peace out. See you next week, fuckers. So long. The National Park Service was formally established by Woodrow Wilson in 1916, and in 1983, writer Wallace Stegner called it “the best idea we ever had. Absolutely American, absolutely democratic, [parks] reflect us at our best.” Today, the Park Service is one of the United States’ most widely emulated federal innovations; over one hundred countries have comparable agencies for protecting public lands. In the United States, the Park Service manages 84 million acres in 393 areas, places where more than 285 million visitors--American, Swiss, Korean--go each year in search of leisure, education, wilderness, or respite. Parks vary in focus--from Philadelphia’s Liberty Bell to Florida’s Everglades to Wrangell-St.-Elias in Alaska, the largest of all parks (nearly double the size of Vermont)--but they are united around the intent, as written in the Park Service Organic Act of 1916, to “conserve the scenery and the natural and historic objects and the wildlife therein and to provide for the enjoyment of the same in such manner and by such means as will leave them unimpaired for the enjoyment of future generations.” I first visited national parks on family vacations, after long road trips complete with car sickness. When I was twenty-two, the Park Service became an employer, the job a summer diversion. And then, over years, a park became a home, the way any home gets made: through work. As in employment, and as in effort. Each with its own set of tools. I’ve now been a “traildog” for sixteen years, a laborer who works in the woods maintaining, repairing, building, and designing trails. The Park Service runs on the backs of my cohorts and me-- seasonals, we’re called--and we perform every manual task. Most people recognize the seasonal NPS poster children, rangers in flat hats giving campfire talks, but few see behind the curtain, where mechanics keep the fleet running and maintenance guys empty reststop outhouses. Carpenters, firefighters. The road crew, repainting traffic stripes, steaming ice out of culverts. And the traildogs. Our numbers may be invisible, but our tasks are concrete. We’re the ones who hike a trail first in the spring to log out fallen trees that cross it. My crew has built the rock steps climbing a mountain pass, and the gravel path that connects parking lot to visitor’s center. We clear rocks from drainage ditches, fill muddy spots. We build bridges, sink signposts, grub reroutes, blast snowdrifts. To get to every job, we hike. If it sounds like simple work, in many ways it is. Once you learn the tools and develop the eye, once you discern your limits and strengths, trailwork can be brute simple. Dig trench. Move log. Roll rock. Swing axe. Yet, like any craft, it’s as complex as you ask it to be: how to sand a tool handle so it fits your grip, tuning a carburetor by ear, what width a bridge stringer can span. And the dawning understanding of why: the way trail grade relates to the angle of the slope it traverses, that aged wood is better than green. If you’re curious, any task can offer something new. There are almost as many reasons to turn hands to physical work as there are tasks that require it. Some people fall into labor because of lineage--a father’s lumberyard, a trade union membership generations long. Others choose labor because it suits them--they’re good with their hands, they see how things work. Sometimes, it’s necessity: an immigrant takes an hourly job when she was a doctor back home. A recession hits, and we do any work we can find. In many cases, labor happens when you can’t afford to pay someone else to do it. We learn a task because the timing was right and an opportunity came along. Or the work just needed to be done. One way or another, there is always work to do, and someone who has to--gets to--wants to--do it. I was not born to labor, not led to it by heritage or expectation. In the age-old dichotomy made too much of, I was headed away from physical work, toward the education meant to save me from it. This is a familiar polarity to many of us, used as we are to lives based on split realities: mind over body, now or later, men against women, work then pleasure, culture versus nature, blue collars and white. In my case, despite a diverse family (teachers and tradesmen) and the climate of 1980s feminism, I inherited a common unspoken baseline. Boys took shop. Smart kids went to college. Think about your future! Sharpen your mind. Sports after homework is done. We all encounter these assumptions and more, and it might surprise us to notice how many of our choices are circumscribed by them. Exercise must fit into the workday. Nature is where we go to escape our ordinary lives. Women in certain arenas are token, if welcome at all. Such schisms may seem purely theoretical until we start to wonder, Who would I be if I chose the opposite? Or, perhaps even more revolutionary, What if they aren’t really opposites at all? Can’t our work bring us pleasure? Culture be based on nature, not carved out? What if manual tasks are mentally rewarding? What if a woman in a man’s world makes it anyone’s world? The problem with my old dichotomy--education, not labor--was the problem with all of them: it entirely missed the point. It turns out, reality is more interwoven--more interesting--than dichotomies allow; it turns out I had a lot to learn. Sixteen years have passed since I went from school to the woods. The details of my life and job are no longer novel. Trailwork is not fetish, hiatus, or a meander off a truer path. Through two decades of changes, years of both drudgery and stimulation, trailwork has been an unexpected constant, the magnetic pull that swings my inner needle true, the thing that has taught me, in a way, how to live. When spring comes, fieldwork calls, and I migrate--back north, back outside, back to “trails,” as we call it from within. Back to a world so tangible to me now I can taste and smell it as I write--chainsaw mix and spruce pitch, diesel fumes and sweat. Henry David Thoreau famously wrote, “I went to the woods in order to live deliberately,” and with this statement, the godfather of American nature writing entrusted to the genre its lasting foundational question: what does the natural world have to do with an authentic life? When I first read Thoreau in high school English, I lived in urban Michigan and had no experience with subsistence tasks. My tomboy youth spent playing in the mud was as close as I’d been to wild, but I’d traded dirt for college prep trimmings: Greek myths and Ivy League catalogs. I had not hoed a row of beans, split firewood, or learned the birds in my backyard by name. Yet I loved Thoreau from the first page. Something about what centered him made sense to me--life connected to the place where you lived, and what you did there. I liked how he was humble yet sure of himself. I liked that he admired squirrels. Despite my attraction to Thoreau, it took me years more to go to the woods, and when I did, I went haphazardly. If you had told me when I was a sophomore intent on grad school in philosophy that I would one day bring home a paycheck by hauling brush and then spend it on the porch of a ratty bar, I would have laughed. I thought of myself as a thinker. My mind was the muscle I’d trained, and as Plato and Augustine taught me, it was the place where my elegant soul dwelt. I didn’t think much about what the body could do.